It is harvest time in County Kildare, just west of Dublin, and the National Ploughing Championships seem to be fuelling more competitive spirit than the Lisbon Treaty campaign. 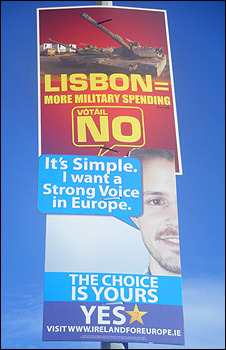 There are "Yes" and "No" Lisbon Treaty posters dotted along the rural roads which lead to the show grounds, but not many. The EU treaty, rejected by Irish voters in June last year, will be put to the vote again on 2 October. This time round, voters generally seem more engaged in the issues. The treaty is meant to streamline EU institutions to make them more efficient, but opponents say it will undermine national sovereignty. 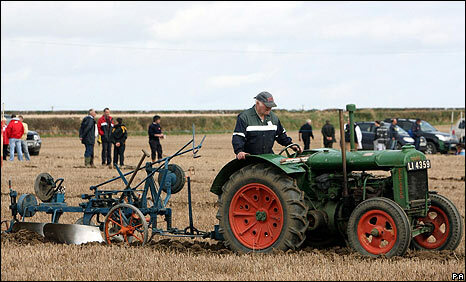 Farmers and rural folk have flocked in their thousands to the fields of Cardenton for the National Ploughing Championships. Myriad trade stands exhibit the best Ireland can offer in farming, engineering, food production. And then there is the art of ploughing itself - the sharp blades glint in the sun as they turn the earth in perfectly straight rows. The credit crunch has battered Ireland, but here you do not get the feeling of recession. There is buying and selling all around - but there are also advice sessions on debt management. The upcoming treaty referendum is not top of the agenda here. Agnes O'Keeffe, a teacher from rural Wicklow, voted "No" last time, but now intends to vote "Yes". "I have changed my mind. I think we are on the periphery of Europe and can't afford to be left out or isolated. I'm still not happy with how our own government has handled things like the economy, and I would have concerns especially for our farming community. But those are not reason enough for me to vote 'No'." She also feels that the information last time was confused and that she is much better informed now about Lisbon. Her friend Kathleen Long, a retired teacher from Donegal, voted "No" before and intends to do so again. "There needs to be more debate on Europe. I think this second poll has come around too quickly. "I would have concerns about the Charter of Fundamental Rights. It will only take one court case in Strasbourg to override these guarantees. I believe we are taking power away from our own national government," she says. Chef Adrian Bridgeman has switched from "No" to "Yes"
Ms Long also complains that there are too many EU directives. "There is one in the farming community that states you can only spread slurry at specific times of year and another one which says when you can cut hedges - that for example on country roads is just dangerous. We need common sense, not silly directives." Kevin Connick, from a rural background in Wexford, is a committed supporter of the Lisbon Treaty. "If we weren't part of the EU we couldn't afford as a nation all we have now, good roads and infrastructure. We are much better off being part of the EU," he says. It is clear that, this time round, the Irish electorate are better informed on the issues involved, and a lot more voters have actively looked for information about the treaty. 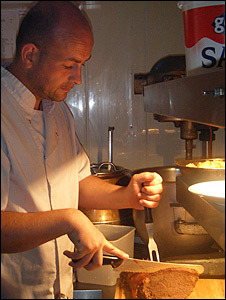 North of Cardenton, chef Adrian Bridgeman from Limerick is busy preparing the carvery in time for the lunchtime rush. He admits he voted "No" last time because he knew nothing about Lisbon. "There was poor media coverage and the literature was hard to understand. This time around I am going to vote 'Yes'. The new campaign is easier to understand, especially regarding my concerns on unemployment and the minimum wage." 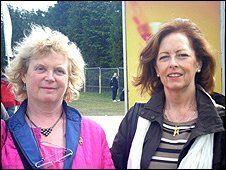 But for two ladies lunching in Kells - Mona Fenton and Geraldine Carolan - there is no agreement on the best way forward. Mona is retired and, like Mr Bridgeman, she voted "No" last time, but she is going to vote "Yes" now. "We are struggling in recession now and I think it will be better for Ireland to vote 'Yes'. We have to borrow money... and I think we have a better chance of getting money from Europe if we agree to the treaty." Ms Carolan, a midwife, voted "No" previously and has not been convinced to change her mind. "I have concerns over Ireland's neutrality. We need our independence to be democratic. I don't think that we should have been asked to vote again." In Dublin city centre Jack Chambers is starting out on his university course at Trinity College, studying law and politics. He is a first-time voter and supports the referendum. "I am confident that the doubts that the Irish people raised in the previous referendum have been dealt with through the legally binding guarantees. "I feel that with these guarantees like taxation, the right to life and neutrality, the Irish people can be assured that the treaty is a step to creating a more progressive and democratic Europe." He also believes Ireland needs to remain at the heart of Europe. "It is crucial for economic development, to attract foreign investment and to create employment," he says. Voices not normally heard in political debate are speaking out about Lisbon - business leaders, sports stars, celebrities. That shows how much is at stake in this referendum.